Early 19th-century multi-chambered slip ware found at the Adam Shafer site. In 2011, construction planning of a new agricultural and environmental resources center at the State University of New York (SUNY) at Cobleskill required that a Phase 1 archaeological survey be performed before construction could be permitted. Curtin Archaeological Consulting, Inc. performed this survey, finding evidence that part of the site had been used by Native Americans during prehistoric times. Jon Vidulich directed this work in the field. Curtin Archaeological also found that Adam Shafer (the descendant of early 18thcentury Palatine German settlers) built a farm house in 1816 on the same terrace overlooking Cobleskill Creek that the Indians had used in a much more remote period. Artifacts from the Shafer farmhouse (including a feature composed of shell) were found in addition to prehistoric Indian artifacts. Subsequently, Curtin Archaeological performed a Phase 2 archaeological site examination in order to evaluate the archaeological importance of the site. I directed this work (if direction actually is needed for a team of co-workers that consisted of Dr. Andrew Farry, Jon Vidulich, and Sarah Vidulich). The results of the Phase 2 investigation indicated that the multi-component, prehistoric-historic period archaeological site was a significant site eligible for inclusion in the State and National Registers of Historic Places. Phase 2 fieldwork: Sarah Vidulich, Jon Vidulich, and Andrew Farry working in the Shafer midden east of the old farmhouse's cellar hole. The finding that the archaeological site was considered significant in this way was based on the value of the archaeological data: the site could provide information important to the study of history and prehistory. In 2012 Curtin Archaeological conducted more fieldwork as part of the process needed to reduce the adverse impact of construction upon the archaeological site; in other words, to mitigate the impact construction would have upon this site as a source of important archaeological data. I co-directed the 2012 fieldwork with Dr. Andrew Farry. Phase 3 excavations in front of the Shafer site front yard. During 2013 and 2014, we have been studying the information we recovered directly from this site. We have also done some other things to help interpret the archaeological data. For example, Kerry Nelson and I have examined primary data from historic documents to better understand the Shafers, their ancestry, and continuity and change in a certain traditional practice: the naming of children in each successive generation of Shafers. What we found was a reliable tradition, until there was a radical departure. We have also been reading literature on the early 18th century German migration to New York State, as well as the nature of cultural change 100 years later, when the old guard of American revolutionaries gave way to the first generation born into the early republic. This new generation was forming the first truly American national identity. This chert artifact from the Shafer site has a graver spur (upper edge) and scraping surface (lower edge). Also, focusing on the intriguing collection of chipped stone (chert) artifacts recovered from the prehistoric component, Meadow Coldon and I have examined other stone artifact collections from Cobleskill, as well as the comparative chert collection in the anthropology office of the New York State Museum. We consulted with New York State Museum geologist Dr. Charles Ver Straeten, whose specialty is the Devonian-age cherts of New York State (the same cherts we needed to know about). Dr. Ver Straeten kindly acquainted us with an even larger comparative collection of cherts such as Esopus and several Onondaga and Helderberg varieties. This dove-tailed well with the field trip he led to Devonian chert exposures in November (and consequently, Meadow and I have added making our own comparative collection and obtaining chert for experimental use to the research program). An Onondaga chert outcrop near Catskill, New York we have visited for the comparative collection. 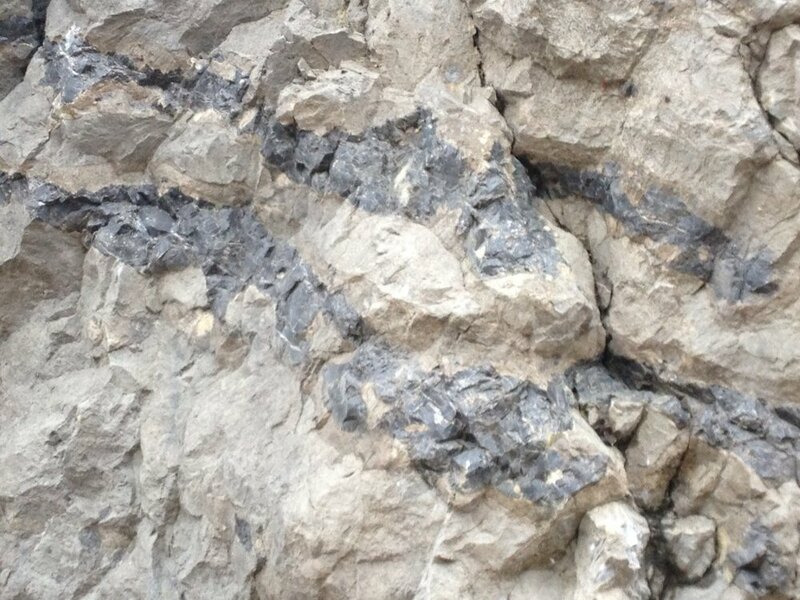 The chert is the dark stone embedded in lighter limestone. As part of this process, we also began a careful study of the life-group exhibits of the New York State Museum for inspiration concerning how to connect ancient stone artifacts with the people of the ancient past. This is an interesting exercise in which we can consider what is being shown in the exhibits, and mindful of what we are learning, we can imagine other scenarios (not exhibited). In this way we carefully use existing knowledge to stimulate thought experiments that broaden our perspective. We are considering additional visits, perhaps with new questions, in conjunction with other projects. I offer this post and a few that will follow on the Adam Shafer site over the next several months in order to provide a greater degree of access to an actual archaeological research project than may be available otherwise (at least much of the time). These posts will provide behind-the-scenes looks at the nuts-and-bolts work that leads to more refined reports of archaeological research.